This week I was inspired by my hubby’s favorite Sunday breakfast — maple syrup dotted chocolate chip pancakes accompanied by an espresso drink. 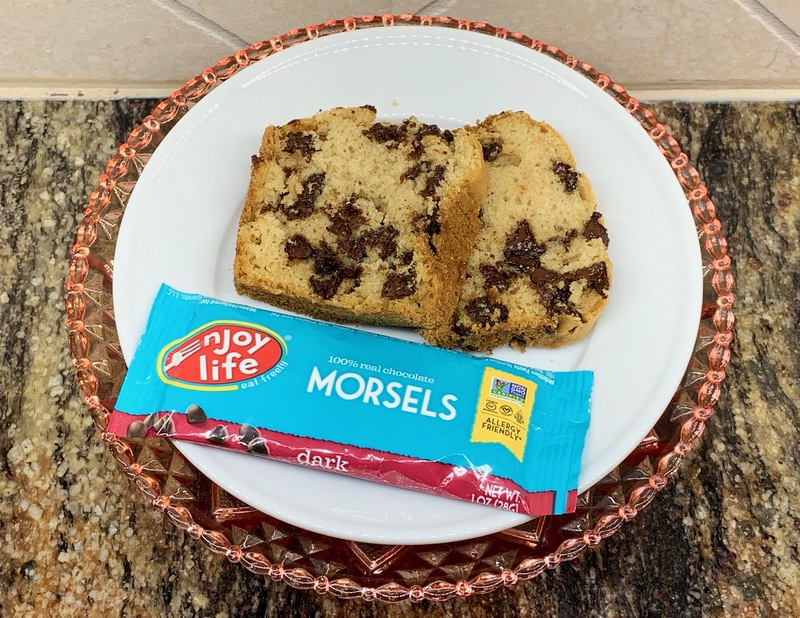 So for his tastebuds, and for yours, I sought out a chocolate chip quick bread to easily recreate the experience. The recipe I found was sweetened with maple syrup that echoes his syrupy pancakes. Then I decided that a coffee drizzle would really elevate the bread by combining chocolate and coffee. Hubby’s favorite flavor after chocolate is coffee, so the bread was a success. To account for high altitude I made several changes. For better structure boosted by the extra protein in all purpose flour, I chose that type of flour instead of the pastry flour called for in the recipe. I also added a bit more flour for altitude. Next I reduced the baking powder and increased the baking soda for a bread that never fell, despite the high altitude. 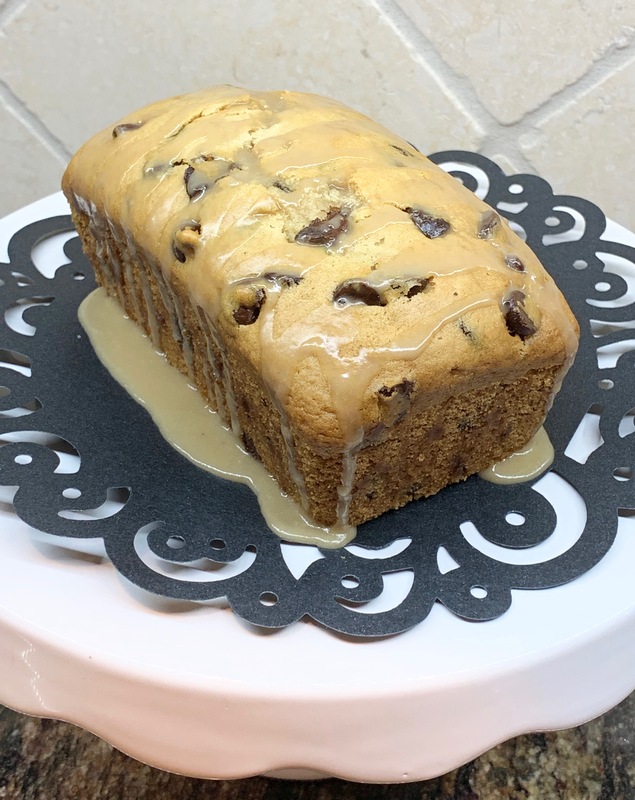 The original recipe was for a fruit bread so I easily exchanged chocolate chips for the fruit. I also added vanilla extract to enhance the chocolate chip taste and add moisture. This tea bread turned out beautiful and delicious. Preheat the oven to 350F. Grease the inside of two of the four sections of a mini loaf pan. In a large bowl, whisk together the flour, baking powder, baking soda, and salt. In a small bowl, whisk together the oil, maple syrup, 1/2 cup milk, and vanilla. Add the wet ingredients to the dry and whisk together until combined. Fold in the chocolate chips. Transfer the batter to the two mini loaf sections. Bake for 32-35 minutes, until an inserted toothpick comes out with just a few crumbs. Cool the loaves on a wire rack for 10 minutes, then allow them to fully cool. Once cool remove the bread by running a knife around the sides of the bread and inverting the pan onto a wire rack. Next flip the bread right-side up onto a plate. For the glaze, whisk together the powdered sugar, 1 tablespoon milk, and coffee extract in a small bowl. Drizzle the glaze over the bread once the bread is completely cooled.